A timeless volume to be read and treasured, The Stone Reader provides an unparalleled overview of contemporary philosophy. Once solely the province of ivory-tower professors and college classrooms, contemporary philosophy was finally emancipated from its academic closet in 2010, when The Stone was launched in The New York Times. First appearing as an online series, the column quickly attracted millions of readers through its accessible examination of universal topics like the nature of science, consciousness and morality, while also probing more contemporary issues such as the morality of drones, gun control and the gender divide. Now collected for the first time in this handsomely designed volume, The Stone Reader presents 133 meaningful and influential essays from the series, placing nearly the entirety of modern philosophical discourse at a reader’s grasp. The book, divided into four broad sections—Philosophy, Science, Religion and Morals, and Society—opens with a series of questions about the scope, history and identity of philosophy: What are the practical uses of philosophy? Does the discipline, begun in the West in ancient Greece with Socrates, favor men and exclude women? Does the history and study of philosophy betray a racial bias against non-white thinkers, or geographical bias toward the West? These questions and others form a foundation for readers as the book moves to the second section, Science, where some of our most urgent contemporary philosophical debates are taking place. Will artificial intelligence compromise our morality? Does neuroscience undermine our free will? Is there is a legitimate place for the humanities in a world where science and technology appear to rule? Should the evidence for global warming change the way we live, or die? In the book’s third section, Religion and Morals, we find philosophy where it is often at its best, sharpest and most disturbing—working through the arguments provoked by competing moral theories in the face of real-life issues and rigorously addressing familiar ethical dilemmas in a new light. Can we have a true moral life without belief in God? What are the dangers of moral relativism? In its final part, Society, The Stone Reader returns to its origins as a forum to encourage philosophers who are willing to engage closely, critically and analytically with the affairs of the day, including economic inequality, technology and racial discrimination. In directly confronting events like the September 11 attacks, the killing of Trayvon Martin, the Sandy Hook School massacre, the essays here reveal the power of philosophy to help shape our viewpoints on nearly every issue we face today. 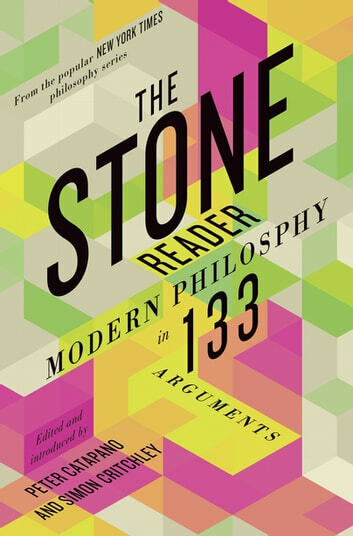 With an introduction by Peter Catapano that details the column’s founding and distinct editorial process at The New York Times, and prefatory notes to each section by Simon Critchley, The Stone Reader promises to become not only an intellectual landmark but also a confirmation that philosophy is, indeed, for everyone.